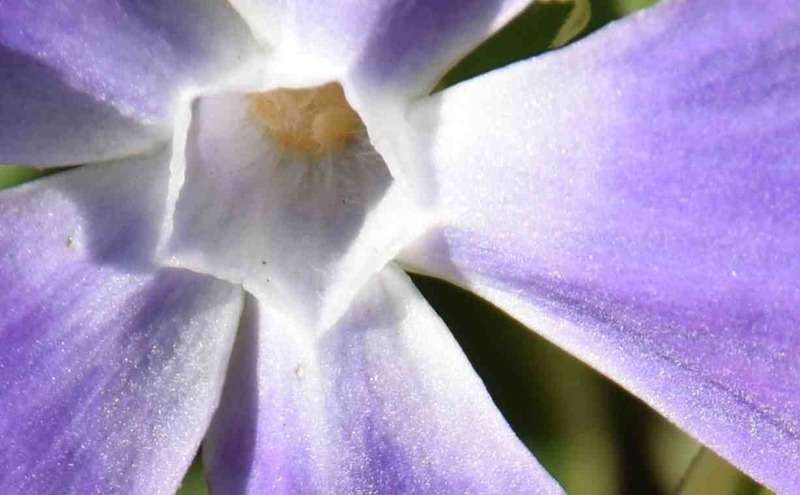 Congratulations if you guessed yesterday’s Macro Monday – it was vinca (periwinkle). It would be expecting a bit much to get the species right and impossible to tell that it had variegated leaves but it was actually Vinca major ‘Variegata’, a vigorous ground cover plant from the countries surrounding the Mediterranean. Despite this it is hardy and although it grows in moist and semi-shaded places in its native lands it is very adaptable in the north west of Europe. In fact you may be forgiven for thinking it is native in the British Isles, it is so happy here. The plain green form is a very vigorous, spreading plant with arching stems that will root at their tips or anywhere else they touch the ground. So although it is only about 40cm high it can spread almost indefinitely, until it reaches a concrete or tarmac barrier, vertical or horizontal. If it has something to scramble through, such as a rose or other shrub it will happily fill in and look shrublike. If it gets out of hand it can be dug out and the roots do not go deep nor are they capable of regrowth. Lovely though the plain green for is, there are others that have a bit more zing. ‘Variegata’, seen here, is much more attractive with leaves overlaid with grey and edged with cream. The pale lavender blue flowers sit very happily against these. ‘Maculata’ has different variegation, the leaves having a buttery yellow splash in the centre, rather like ‘Surrey Marble’. The brightest, in terms of foliage, is ‘Wojo’s Jem’ which has leaves that are largely cream when young, then almost white with dark green margins. Because of the large amount of cream leaf tissue it is slower growing. Few garden plants have a longer flowering period and although the main flush of blooms is in late spring it is not unusual to find flowers here and there almost all year round. 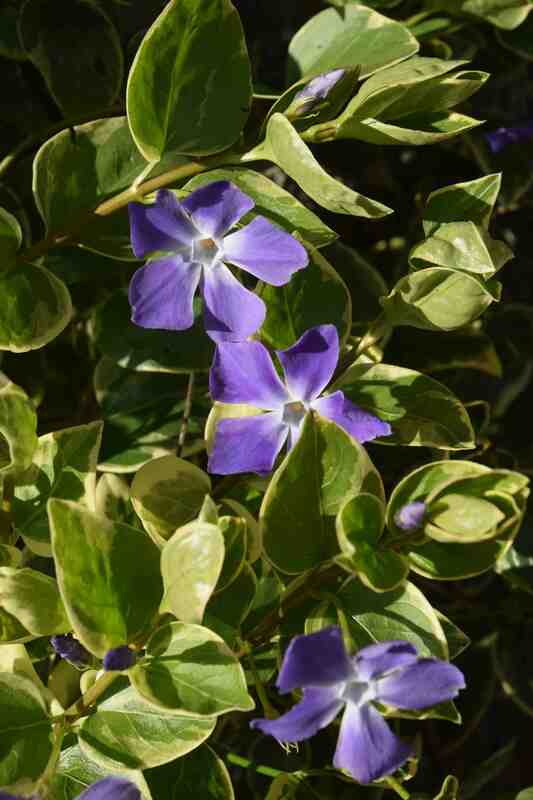 The name vinca is derived from the Latin vincire which means to bind because the leafy stems were used in garlands. You will be aware of the appropriateness of this if you have ever tried to walk through a clump of this plant and been tripped up by the numerous hooped stems. The name periwinkle is thought to be a corruption of pervinkle which, in turn, is derived from the Latin pervincire meaning to wind about. 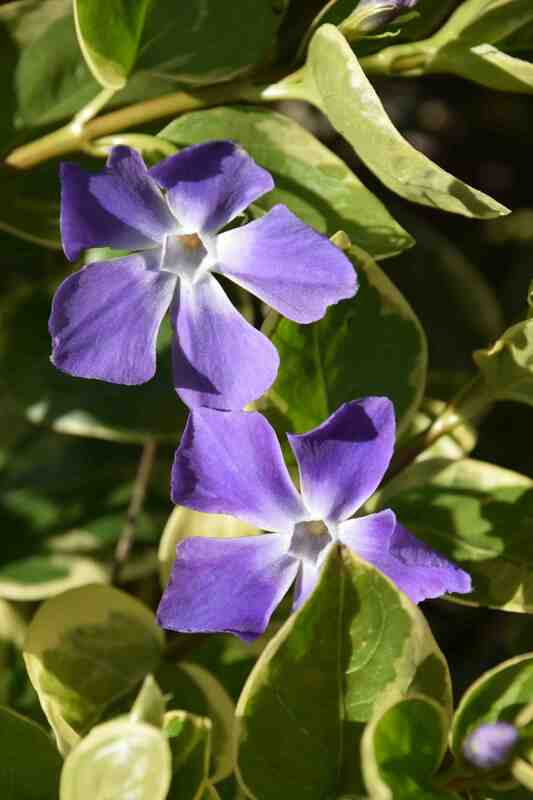 In the language of flowers, periwinkle represents sweet memories. And back to reality, vinca is a member of the Apocynaceae, a family perhaps best known for its many poisonous members – the most familiar of which is probably the oleander (Nerium oleander).